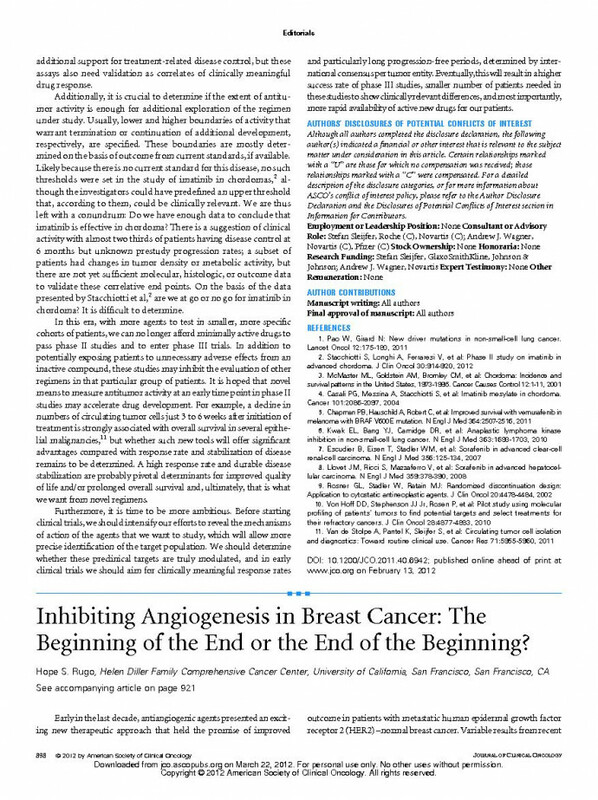 Inhibiting Angiogenesis in Breast Cancer: The Beginning of the End or the End of the Beginning? Corresponding author: Hope S. Rugo, University of California, San Francisco, 1600 Divisadero Ave, Second Floor, Box 1710, San Francisco, CA 94115; e-mail: hrugo@medicine.ucsf.edu. Early in the last decade, antiangiogenic agents presented an exciting new therapeutic approach that held the promise of improved outcome in patients with metastatic human epidermal growth factor receptor 2 (HER2) –normal breast cancer. Variable results from recent phase III trials have called this enthusiasm into question. One contributing factor could be breast cancer heterogeneity. For example, in breast cancer, chemotherapy has been traditionally used in a one-size-fits-all approach. After decades of research and many clinical trials that have enrolled thousands of patients, we have now learned that, if accurately assessed, tumor biology determines response to specific classes of agents. Given this, we might ask what led us to believe that antiangiogenic therapy would improve outcome independent of tumor biology? The biology of angiogenesis remains incompletely understood. Seminal work by Folkman,1 along with that of other researchers, demonstrated the importance of angiogenesis to tumor growth and metastatic potential. Preclinical models initially suggested that antiangiogenic agents could reverse resistance and improve response to common chemotherapy agents in a number of solid tumors, although the mechanism of action is complex. Subsequently, tumor regrowth with ongoing treatment,2–4 as well as the flare of angiogenic activity after withdrawal of antiangiogenic therapy, was demonstrated in a number of preclinical models,5,6 but at that time many clinical trials in breast cancer were ongoing or already completed. Although the flare effect has been observed in some clinical settings, the clinical significance of these findings remain unclear. A number of types of agents with antiangiogenic activity have been studied in patients with breast cancer, and many of these agents are approved for the treatment of other malignancies such as renal cell cancer, colorectal cancer, and other less common diseases. Broad drug classes of agents include antibodies such as bevacizumab (that binds to vascular endothelial growth factor, [VEGF]) and ramucirumab (that binds to the VEGF receptor [VEGFR] itself), receptor mimetics such as aflibercept, and small-molecule oral tyrosine kinase inhibitors (TKIs) that inhibit a wide variety of targets, including VEGFR, platelet-derived growth factor receptor, and many others. Toxicity varies considerably depending on the mechanism of action and target specificity. Essentially all antiangiogenic agents cause hypertension, but the oral TKIs have unique adverse effects such as bone marrow suppression and palmar plantar erythema that differ by agent, presumably because of off-target activity. Serious toxicities are rare and include bowel perforation, microangiopathic hemolytic anemia, squamous cell carcinoma of the skin, and congestive heart failure. Interestingly, bevacizumab seems to be the least toxic of the approved antiangiogenic drugs and can be combined with both chemotherapy and hormonal therapy without a significant effect on adverse events. This is not true for TKIs, for which toxicity results in limitations on dose, schedule, and the ability to test combinations with chemotherapy. In the article that accompanies this editorial, Bergh et al7 report the results of one of several phase III trials that evaluated the effect of the multitargeted TKI sunitinib in combination with chemotherapy in patients with advanced breast cancer. Almost 600 patients with chemotherapy-naive metastatic disease were randomly assigned to receive standard-dose docetaxel alone every 3 weeks, or a reduced dose of docetaxel with sunitinib that was given for 2 weeks starting on day 2 of each cycle. Although previous studies evaluated sunitinib at a higher dose that was given on a 4-week-on, 2-week-off schedule,8 a shorter course in combination with docetaxel was hoped to reduce hematologic toxicity.9 The trial was powered to detect a 50% increase in progression-free survival (PFS), from 6 to 9 months, although the actual PFS was about 8.5 months in both arms. A small but statistically significant increase in overall response was reported, without a difference in survival. The addition of sunitinib did not increase hematologic toxicity but resulted in a marked increase in skin toxicity (16% absolute increase in grade 3 to 4 hand-foot syndrome). A numerical increase in deaths6 in the combination arm because of cardiac, infectious, and embolic cases was reported; we can presume that this excess was at least in part a result of the addition of sunitinib. More than 1,800 patients with metastatic breast cancer have been treated with sunitinib in phase II and III trials. What was behind this extensive effort, which led to consistently negative results? Historically there was little biologic rationale for either the schedule or specific dose of sunitinib used in this and the other phase III trials. Combination studies were begun after modest single-agent activity was demonstrated in a phase II trial in heavily pretreated disease.8 Small safety studies did not demonstrate the extent of toxicity that limited exposure to the drug during the larger trials, but even in trials in which dose intensity was maintained, efficacy was not seen. Clearly we need a new approach for the study of new antiangiogenic agents and novel agents that will enable us to define reliable biomarkers that can predict likelihood of response and resistance. Serial tumor biopsies could help to identify potential markers of response but are rarely incorporated into clinical trials because of concerns about decreasing or delaying accrual. Paired tumor samples were obtained in seven patients treated in each arm of the currently reported sunitinib and docetaxel trial.7 Widespread nonspecific transcriptome alterations were seen, but the small sample size and lack of significant differential response made correlation with clinical outcomes impossible. Clearly this is a critical need that has not been adequately addressed. Six randomized phase III trials have been conducted that have evaluated the addition of bevacizumab to chemotherapy in patients with advanced breast cancer.15–20 All but one trial met its primary end point, improved PFS, but none of these trials demonstrated improved overall survival with the addition of bevacizumab. These data have led to considerable controversy regarding the use of bevacizumab for the treatment of metastatic breast cancer, with the resulting recent withdrawal of approval by the US Food and Drug Administration after extensive data review and an unprecedented public hearing. Could these data have been stronger had we been able to identify either a population of patients or tumor biology likely to benefit, or a marker of response? Does antiangiogenic therapy have a future in the treatment of breast cancer, and does the type of agent (ie, antibody or TKI) and its specificity to target make a difference? It seems that the type of agent is critical and that lack of specificity limits rather than increases clinical activity in breast cancer. To date, only one VEGFR multitargeted TKI has resulted in encouraging combination data in metastatic breast cancer, with modest improvements in PFS in two of four randomized phase II trials with sorafenib. We are at the end of the beginning, and hopefully the lessons learned from this and other trials will be incorporated with enthusiasm into both current and future studies. A number of bevacizumab studies are either awaiting analysis or are actively accruing, including three adjuvant trials with bevacizumab: Eastern Cooperative Oncology Group (ECOG) 5103 in HER2-normal disease, Treatment of HER2 Positive Breast Cancer With Chemotherapy Plus Trastuzumab vs Chemotherapy Plus Trastuzumab Plus Bevacizumab (the BETH trial), and A Study of Avastin (Bevacizumab) Adjuvant Therapy in Triple Negative Breast Cancer (the BEATRICE trial). In the metastatic setting, the CALGB (Cancer and Leukemia Group B; now The Alliance) study 40503 is evaluating the addition of bevacizumab to first-line hormone therapy, and the oral TKI sorafenib is being studied in combination with capecitabine in the phase III RESILIENCE trial (A Phase III Trial Comparing Capecitabine in Combination With Sorafenib or Placebo for Treatment of Locally-Advanced or Metastatic HER2-Negative Breast Cancer). A phase III trial in the first-line setting that has now completed accrual is evaluating the combination of ramucirumab, an antibody to the VEGFR, in combination with docetaxel. The MERiDiAN trial, opening in 2012, is a phase III trial modeled after ECOG 2100 that will specifically evaluate the impact of bevacizumab in patients stratified by plasma VEGF-A levels, in hopes of identifying a potential predictive marker for benefit. Newer drugs, such as vascular disrupting agents, are also being investigated. As we move forward, we must somehow meld the financial and therapeutic need to move quickly through drug development with the critical requirement to identify markers of response before embarking on large-scale randomized trials. Tumor samples from the active tumor (eg, tumor obtained at the time of relapse as opposed to that archived from initial early-stage diagnosis) should be part of this effort, but tissue evaluation must be hypothesis driven.25 We can still learn from the past—to paraphrase William Osler, the benefit of experience is not in treating everyone, but in treating wisely. The era of multiple nonspecific phase III trials in breast cancer should be over. Although all authors completed the disclosure declaration, the following author(s) indicated a financial or other interest that is relevant to the subject matter under consideration in this article. Certain relationships marked with a “U” are those for which no compensation was received; those relationships marked with a “C” were compensated. For a detailed description of the disclosure categories, or for more information about ASCO's conflict of interest policy, please refer to the Author Disclosure Declaration and the Disclosures of Potential Conflicts of Interest section in Information for Contributors.